Home Good Beer Folk: Emily Boileau Learn more about the Assistant Brand Manager of Fat Tire, Emily Boileau. 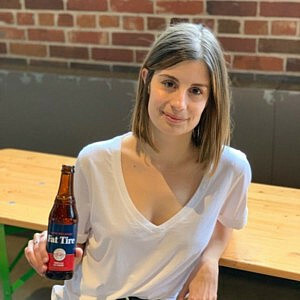 We spoke with Emily Boileau, Assistant Brand Manager for Fat Tire about the brand-new craft beer from the US that Steam Whistle is adding to its growing family of beers. Fat Tire will be coming to a local liquor retailor near you this Spring! How long have you worked at Steam Whistle and how has your work evolved since you started? I have been at Steam Whistle for just over 5 years. I started in the Retail, Events and Promotions department, where I gave tours, worked offsite events and aided in the customer experience here at the Roundhouse. From there I moved on to Inventory Coordinator, overseeing everything on the merchandise side. About 1 year ago I was fortunate enough to join the marketing team. The best part of my evolution at Steam Whistle is that I’ve had such incredible opportunities to work with Good Beer Folks in every department and on so many different projects. What’s your favourite aspect of working with a brewery? Is it too cliché to say “the beer?” That is an incredible aspect as it has allowed me to not only enjoy a completely respectable amount of Steam Whistle but also to experience so many other local craft beers. Craft beer is such a community and you find yourself surrounded by a lot of likeminded people with similar interests. Tell us about Fat Tire! Where did it come from? Fat Tire is the flagship Amber Ale from New Belgium Brewing, a craft brewery founded in Fort Collins, Colorado. New Belgium was inspired by a bicycling trip through Belgium in 1988 and has really become the gold standard in terms of sustainability in the industry. Why is Steam Whistle bringing this American craft beer to the Canadian market? Why do we want to add it to our portfolio (“Family of Beers”)? Since our inception in 2000, we have been heavily inspired by a number of New Belgium initiatives. We are recognized as the “Greenest Brewery in Canada”, a title which they hold in the US. After 5 years of “Good Beer Folk” service, we reward our employees with an all expense paid trip to Munich, Germany, for Oktoberfest. After 5 years of service at New Belgium, staff are taken to Belgium, to experience beer culture there. Besides all of our similarities, we have spent the last 19 years perfecting our Pilsner, so that we can offer Canadians the best in craft beer. By bringing Fat Tire to Canada from Colorado, we are able to bring another expectational, high quality craft beer to thirsty Canadians. When will it enter the Canadian market and where can consumers purchase it? Fat Tire is currently imported from New Belgium to the Alberta market for retail and on-premise sale, which we have taken over as we perfect the recipe. We have already run our first test brew and it went great! We are aiming to launch in market in May and Canadians will be able to purchase it at liquor retailers all over the country, as well as enjoying it at many of their favourite bars and restaurants. For consumers who haven’t tried Fat Tire yet, what can they expect? Fat Tire is an all natural, premium craft beer with a beautiful amber colour, herbal hop aroma and a subtle malt sweetness. The finish is rounded out by spicy, fruity notes from Belgian yeast. An incredibly sessionable ale, Fat Tire makes a wonderful reward after enjoying an outside activity, is the perfect fit for getting together with friends and offers a number of pairing opportunities for your favourite meals. Where’s your favourite place to enjoy Fat Tire? The New Belgium team has done an incredible job as bringing Fat Tire to life as the beer of outdoors, which we plan to continue here in Canada. So I think the best place for a Fat Tire is outside! Whether it is post-adventure, post-activity or just for relaxation. Second to that, Fat Tire is an incredible sessionable, easy to drink beer so its great to enjoy anywhere! 1. What song gets you on the dance floor? If there are people who can resist getting up and dancing to “Hey Ya” by Outkast, then I think that would be a very good indication of character, because that song is irresistible. Any good 90s throwback also works… however if I’ve had a few Steam Whistles or Fat Tires, pretty much anything will do it, regardless of tempo or appropriateness. 2. What song reminds you of your youth? I’ve always had extremely eclectic music tastes and music was very important in my house growing up. I’m fairly confident I was the only 5thgrade Elvis fan so whenever I hear “Hound Dog” I am immediately transported to the year I got glasses AND braces (that’s right, a double threat). 3. What’s a song that was played at your first concert? The first concert I attended was by a Canadian band called Wave (think B4-4 Canuck style). I was probably about 13 or 14. I remember being incredibly excited because my parents were going to drop myself and a friend off (a block away, of course) and we’d be attending by ourselves. They played their number one hit “California” to an ocean of giddy tweens. 4. What’s your favourite cover? Hmm tough call but I think I’ll probably have to go with the Jimi Hendrix Experience version of “All Along the Watchtower” by Bob Dylan. The entire Dirty Dancing soundtrack. It is impossible to listen to “Time of My Life” without wanting to throw on denim cut offs and find the nearest lake to practice lifts in. 6. It’s Friday night, your friends are over getting ready to go out, what’s your pre-game song? I am, pretty, strictly speaking, a total homebody. But if a special event manages to coax me out of my den then I would definitely throw on some Lizzo, like “Good as Hell”. 7. Go to karaoke song? I think my biggest problem (outside of being an atrocious singer) is that I don’t have a go-to karaoke song. It changes every time so there has been no chance of perfecting or improving the performance. I’ve done AC-DC, Aqua and once (very embarrassingly) “Drop It Like It’s Hot” à la Snoop Dogg. 8. A song you know every word to? My friends’ actually refer to me as a musical jukebox because I always seem to know all the words to many, many songs. Hopefully all of these lyrics aren’t taking the place of much more valuable information like my mother’s birthday or what to do in a fire. Most impressive would probably be “Bennie and the Jets” though. Some of those words are hard to recognize! 9. What song is on highest rotation for you right now? 10. What would be the intro music for the movie adaption of your life story? “Black Dog” by Led Zeppelin, my favourite band!